This caught our eye recently. 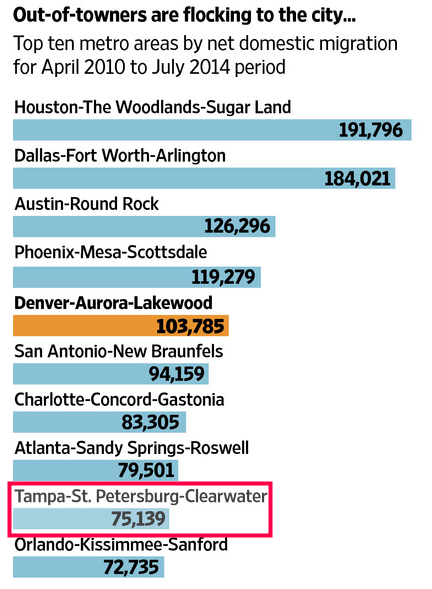 Tampa Bay makes the top 10 list of places receiving the most net migration since 2010. How could this be, with all the pessimism we hear about that we're not keeping up? Clearly we're doing pretty well by this in flow migration metric. People actually are voting with their feet. Here's the relevant chart from the cited WSJ article. The top 3, and 3 of the top 6, are in Texas. All of the top ten are in the sunshine belt, all in low tax, low regulation red states. Not a single city in New York. Silicon Valley does not even make the top 10. Not a single city in California. None of these top ten metro areas would be transit nirvana either, yet people still are flocking to them for real and improved opportunities. Clearly, these people believe they have a better future in these locations than elsewhere and Tampa Bay is part of that influx. Florida overall continues to grow, adding 450,000 new migrants, passing New York as the 3rd largest state, and was second overall in domestic migration. Again, all the top ten states are in the south or west, and primarily red states politically. 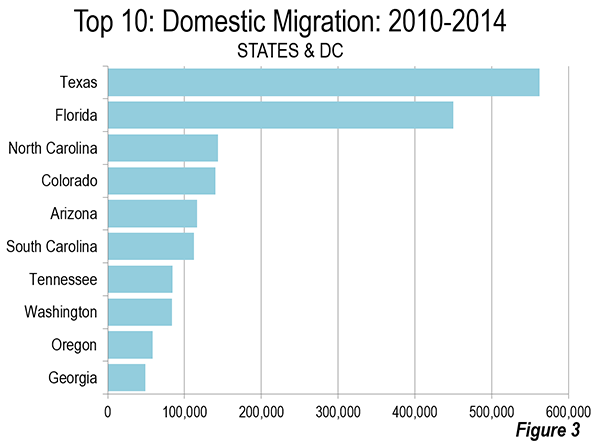 The bottom five in net domestic migration are the usual suspects -- New York, Illinois, California, Michigan and Ohio. No sunbelt states were in the bottom 10. To attract young people, it seems, the cities of America don’t have to worry about being hip. Instead, they need to create dynamic economic environments. That is what draws the talented young—and in turn, it seems, they do their part to make their new homes nicer. Those blue states and cities pursuing progressive policies supposedly for the working and minority class are actually driving them out to municipalities that are more affordable and offer more opportunities. All the blue states talk is not working. The people are voting with their feet. 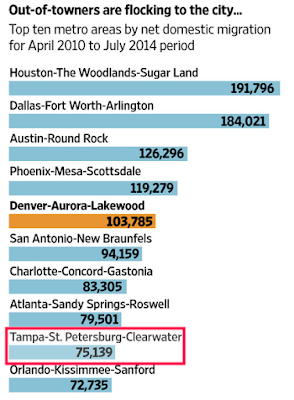 As we've noted here and here, most of our growth is in Hillsborough County and Pasco County, the suburbs, and not city of Tampa. When our political or business leaders complain that we aren't keeping up, we are, and we are doing just fine, thank you. Just don't blow it, Tampa Bay, by listening to those that want us to adopt the failed policies of the blue states people are are escaping. Keep it cool. Keep it diverse. Keep it affordable. Keep it open and dynamic.